Many of you know that “Hugs” is one of my favorite Positive Discipline Tool Cards. A hug is one of the best ways to create the important theme of Positive Discipline: Connection Before Correction. I have been receiving some great hug stories and have decided to start collecting them and sharing them with you. Shannon Alvarez, a member of the Positive Discipline Network just posted the following story and gave me permission to share it on this blog. “I thought you would appreciate this story. I know some of the PD strategies because my mom has taught me a lot, but I am new to PD and only just reading my first Jane Nelson book: Positive Time Out. Anyway, last night, I told my husband he could either put my 3 year old to bed (she was already bathed) or bathe the other 3 kids. So he decided to put my daughter to bed. Well, she wasn't happy about not having mommy to read her books, so she was not being nice to him and eventually socked him right in the eye. Of course, my husband got really upset and started being mean to her and telling her she wasn't going to get any books, etc. At this point, I walked in, not realizing what was going on. After my (steaming mad!) husband told me what was going on, I told him she needs a hug. It took him about a full minute (with my coaching) to come down from HIS anger to allow himself to go back to her and hug her, but he eventually did and he told her that he loved her, etc. (At this point I walked out of the room, so I'm not sure everything that was said) But when I walked past again, they were snuggling together on the bed and reading books. Later my husband thanked me for helping him through that moment and he was surprised at how well it worked. It was such a breakthrough in his mind for Positive Discipline, it was awesome!!! As soon as I finish the Positive Time Out book, I plan to hold a family meeting and start implementing asap! I love the concept and I am confident it will work in my family! (Even for my strong willed children!) Thanks for all you do!" If you are not already a member of the Positive Discipline Network, you might want to join (it's complimentary) and join us for the first live chat on November 9, at 6:30 PM PST and 9:30 EST. You can register for the event here. When does Positive Discipline stop being Positive Discipline? Many people are drawn to Positive Discipline because they want to treat their children respectfully and they are against punishment. Others want to learn how to use punishment in positive way and are shocked when they learn that Positive Discipline does not advocate any form of punishment. They assume, therefore, the Positive Discipline advocates permissiveness—far from the truth. It is interesting to note that two people with these opposing philosophies often get married. One has a tendency to be just a little too lenient. The other has a tendency to be just a little too strict. Then the lenient parent thinks he or she needs to be just a little more lenient to make up for the mean-old-strict parent. The strict parent thinks he or she needs to be just a little more strict to make up for the wishy-washy lenient parent—so they get further and further apart and fight about who is right and who is wrong. In truth they are both being ineffective. Enter kindness and firmness at the same time. Being kind and firm at the same time is a foundation concept of Positive Discipline. PD stops being PD when you are too kind without being firm and/or when you are too firm without being kind. Positive Discipline stops being Positive Discipline when you are too kind or too firm. The attached activity is designed to increase your awareness of your style, to get into the child’s world to understand what your style may invite, and to practice kindness and firmness and the same time. To help parents understand the value of being kind and firm at the same time. Comment: Beware of “either/or” thinking. Life is not always about either/or. Think about having to choose between breathing in and breathing out. Wouldn’t it be better to think in terms of both/and? What insights did you gain by filling out the questionnaire? Do you lean toward being too kind, too firm, or vacillate between the two extremes? 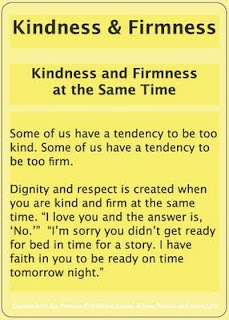 If you have a tendency to be too kind without being firm, what can you learn from people who have a tendency to be firm? If you have a tendency to be too firm without being kind, what can you learn from people you have a tendency to be kind? Comment: Being just kind or just firm can be as dangerous psychologically as just breathing in or just breathing out can be physiologically. Positive Discipline tools are based on being both kind AND firm. 1. What kind of environment do parents hope to create for children by being kind? 2. What characteristics do parents hope their children will learn from an environment of kindness? 3. What do kind parents think are the negatives of being firm—what kind of environment are they afraid children will experience from too firmness (which they may think of as punishment)? 4. What kind of environment do parents hope to create for children by being firm? 5. What characteristics do parents hope their children learn from and environment of firmness? 6. What do firm parents think are the negatives of being kind—what kind of environment are they afraid children will experience from too kindness (which they may think of as permissive)?